Even as a little boy Fraser wanted to be a sculptor. He would search for scrap pieces of limestone at a quarry near his home and carve them into figures. By the time Fraser was fourteen his family had realized he had serious talent and sent him to Chicago to study at the Art Institute there. 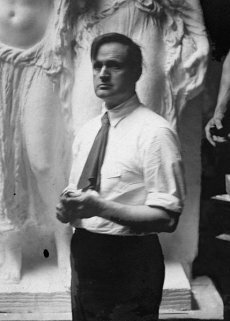 Fraser also worked as an assistant to Richard Bock, the respected sculptor who is probably best known now for his collaborations with Frank Lloyd Wright. When he was nineteen Fraser went to Paris to attend the École des Beaux-Arts (School of Fine Arts) and entered a competition there that was being judged by Augustus Saint Gaudens. Saint Gaudens felt that Fraser showed a lot of promise and hired him as one of his assistants. Fraser returned with Saint Gaudens to the United States and worked with him for several years in New York. Even after Fraser left Saint Gaudens’s employment and opened his own studio, the relationship remained very friendly. Saint Gaudens would frequently refer clients to Fraser, and Saint Gaudens’s artistic style obviously continued to have great influence over Fraser’s work. When Saint Gaudens died not long after designing two new coins for the U.S. Mint, Fraser approached the Mint with his own design. 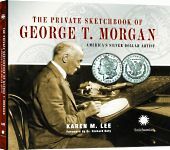 The Mint Director and Treasury Secretary liked what they saw, and the Buffalo Nickel (also called the Indian Head Nickel), went into production in 1913. It continued to be minted for twenty-six years. To celebrate the end of World War I, in 1919 Fraser was asked to design a new Victory Medal. Anyone who had served in the U.S. military during World War I was eligible to receive the medal. 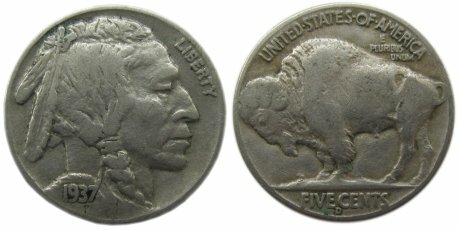 The Victory Medal was more well-known in its time than the Buffalo Nickel, although its fame faded after it was replaced with a new Victory Medal in World War II. Fraser also designed the Navy Cross, the second highest decoration for valor (just under the Medal of Honor in importance) that is awarded for “extraordinary heroism in combat” to members of the Navy, Marines, and Coast Guard. The Navy Cross was established in 1919 and is still awarded to this day. 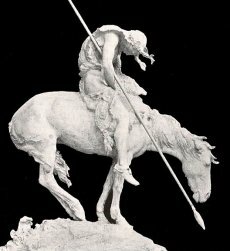 Fraser’s most famous sculpture is his 1915 work “End of the Trail,” a tribute to Native Americans that had been commissioned by Clarence Shaler. The sculpture was originally planned to be cast in bronze, but there was a bronze shortage because of World War I, and the sculpture was cast in plaster instead. Over the years the plaster statue seriously deteriorated until it was restored in 1968 by the National Cowboy and Western Heritage Museum. It is currently on display at the Oklahoma City Museum. “End of the Trail” is a very popular image, having been featured on calendars, in prints and posters, and as replica sculptures. It is even the official seal of the city of Waupun, Wisconsin. As the years went by Fraser’s style became more modern and less complicated, and he began to concentrate on larger works — more monuments and architectural elements, fewer smaller statues. Fraser remained very much in demand through the 1930’s and 1940’s and into the early 1950’s, and he continued to work at his New York studio until his death on October 11, 1953. He was 76 years old. Filed under Buffalo Nickel, Coin Designers, Indian Head Nickel.